As we get ready to shut down over Christmas, we thought we’d take the chance to look back on the year – and what a year it’s been! We’ve had two new additions to our team: James joined the artificial grass team in April and has been helping Greg save gardens all over the West Midlands! Meanwhile Melissa joined us in August and has been working closely with Marc in the office to ensure everything runs smoothly. We also moved into a new office at Wassell Grove Business Centre in March. We couldn’t be happier having a ‘home’ at the business centre, as we have been made to feel welcome from the very start. Having a larger space has allowed us to create a display area showcasing samples that have been kindly sent to us by our suppliers. This has also helped develop our quotation process and service immensely, as we now invite all prospective clients to our office to see the materials we propose to us on their garden in person. Another huge milestone was the launch of our company database. This has been a great success and has added a real professional edge to our customer service as we are now able to create detailed, personal ‘storyboards’ instead of generic quotes. Our database is ever changing and we’re excited to see what more we can add to it to take us to the next level! Our reputation has also increased thanks to us improving our links with established companies. 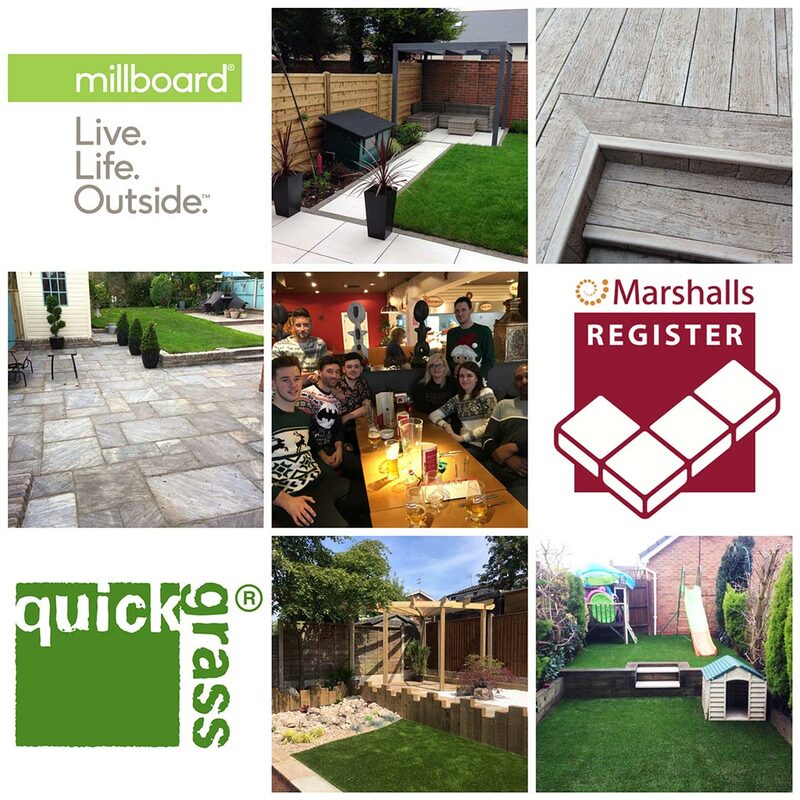 As well as being approved installers for Quickgrass, we are now approved installers for Millboard composite decking and Marshalls. We have also been taking on more and more work with Quickgrass, including some lucrative commercial projects. It really means a lot that these companies believe our work is of a quality that they are happy to endorse, but it wouldn’t be possible without the hard work that has been put in by every member of our team. So… what are our plans for 2018? We are always looking to grow our business further, and one of our aims is to be able to have another grass team as well as a full time Millboard decking team. We also want to start of the process of becoming a member of the APL (Association of Professional Landscapers) as well as becoming approved installers for more quality companies. We also want to say a big thank you to everyone for all of your support over the past year. Here’s to 2018 being another successful year!